What is DSD audio? How it works, where to download files, and more | What Hi-Fi? The DSD format seems to be back in fashion again. Most new digital products boast DSD compatibility, and the music catalogue is now big enough to command respect, especially if you’re into jazz and classical. But what is it? And how is it different from the digital signals used in CDs and every other hi-res music format? Let us explain. Digital signals take the form of two states that can be represented by 0 and 1, but this information needs to be arranged in a specific way to be of any use. In just about every case the system to organise the digits is known as PCM (Pulse Code Modulation). Let’s have a quick recap of how PCM works before we continue. With PCM, the original analogue music waveform is described in two parts. The first is its amplitude (size). In CD this is represented by 16-bits of digital data, which gives us the ability to define 65,536 different signal levels. The original music waveform has to be measured at regular intervals in order for it to be represented properly. The measurement is done 44,100 times a second. While that looks like an arbitrarily large number, it’s chosen quite carefully to ensure that the full frequency range of human hearing (20Hz to 20kHz) is covered. 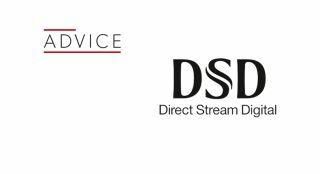 DSD (Direct Stream Digital) takes a different approach. Back in the mid-1990s, it was originally conceived as a way of archiving old analogue recordings. It was designed to be a simpler, more space efficient way of storing digital music data than PCM. Importantly, DSD was also designed to be easy to convert to PCM files with sampling rates based on multiples of 44.1kHz. Around the same time, Sony and Philips were developing a replacement for CD, something that ultimately became the SACD disc. DSD seemed an ideal system to build the new format around, particularly as it has great copy protection. The main attraction of DSD is its simplicity and, with that, cheapness of implementation. It needs less processing than PCM and can use simpler, far less expensive DACs. DSD uses a single bit of information, and all this information tells us is whether the current sample of the analogue waveform is higher or lower than in the previous one. Compared with the over 65,000 different values 16-bit PCM has, the two values (0 if the new sample if the signal is lower or 1 if it’s higher) of DSD appear mighty limiting. That resolution shortfall is made up by the very high sampling rate of over 2.8 million times a second – that’s 64 times the speed of CD. Standard DSD is sometimes called DSD64 for this reason, with double and quadruple speed versions called DSD128 and DSD256 respectively. There's even a DSD512 spec, though we've never heard any material encoded in it. Standard DSD recordings are still relatively rare compared with the PCM alternatives, and those higher speed versions are extremely niche. DSD fans claim the format is as close to analogue as digital gets. If you could look at a DSD digital stream, it’s possible to draw the analogue waveform simply by looking at the density of 0s and 1s. The more 0s there are, the lower the waveform goes, and it’s the opposite for ones. Where there is a balance of the two values, we’re at, or close to, the zero signal point. What are the downsides to DSD? That all looks good, but there are also issues with DSD. It’s not very practical to manipulate a DSD recording. All the things that are required post-recording such as equalisation, editing, dynamic range control and adding reverb usually involve the DSD stream being converted to PCM to do the processing and then switched back. That’s hardly a pure way of doing things, right? Just about every studio recording made with DSD goes through this process. It’s down to a lack of suitable equipment and processing software. You may come across the term DXD on a recording. This is where the original DSD signal has been converted to 24-bit/352kHz PCM and processed in that form throughout. While the name (intentionally or not) sounds like DSD, it is simply very high resolution PCM. When it comes to measurement, DSD also has issues with high levels of noise compared with PCM. Clever processing techniques allow the engineers to shift the noise above our hearing, and optimise the performance and dynamic range in the audible region. The high-frequency noise is generally filtered out. So how high resolution is a DSD recording? There’s no exact way of striking equivalence between PCM and DSD but it’s around the same as 24-bit/88.2kHz PCM. In terms of dynamic range, DSD is claimed to be around 120dB in the audible frequency range. In comparison, CD measures around 96dB, and 24-bit/192kHz recordings have a theoretical maximum of around 144dB. Although the bigger numbers are more impressive, even the range of CD is considered more than enough to cope with any recording. How do you play DSD? DSD playback has become far more common in digital equipment over recent years and that’s down to the greater availability of downloadable music files. Just make sure your portable music player, streamer and/or DAC are compatible with the format. Most recent mid-to-high end digital playback equipment tends to be compatible, so if you have something suitable there’s no reason to treat it any different from FLAC or WAV files. Even flagship smartphones such as the Samsung Galaxy S9+ support DSD natively. Even Apple iPhone users can play DSD files using additional equipment. On a download site, you may occasionally come across the terms DSF and DFF. These are two kinds of DSD files, but the only thing you need to know about them is that you should always choose the DSF version if your player is compatible – it’s better at holding a track's metadata information (artist/song name, album art etc). Where can you buy DSD audio files? Most of the major audiophile music sites sell DSD downloads. The likes of HDtracks, Highresaudio and Primephonic are good places to start. Alternatively, if you prefer physical formats and have a compatible disc player, then SACDs are still fairly widely available.